Have you noticed how a rainy day can make you feel just a little bit sad? Do you find yourself waiting at the window for that sliver of sunshine to perk up your mood? Don't worry; you're not alone; and help is at hand! 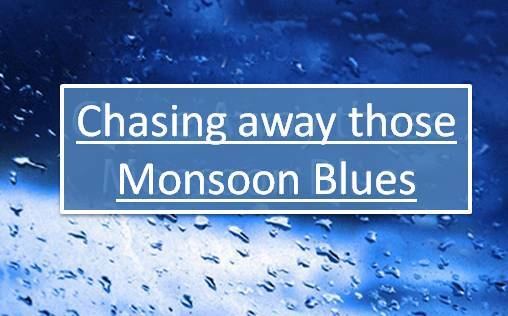 Here are a few ways to get rid of your “monsoon blues”. To start with, wear bright colours.It will lift your mood instantly. Write- the simple act of penning down your thoughts is a real mood booster. You don’t have to be a “writer” to write. Ensure that you are not idle in your free time. Read a book, watch a movie, or chat with a friend. Do whatever works for you. Call a friend over and make a day of it. There’s nothing like a friend to cheer you up. Try out a new dish, if you like to cook. It can be a real therapy. Indulge yourself a little bit, give into that urge for snacks and confort food. Just remember not to overdo it. Bring out that child in you. Go play a sport in the rain. That can be a very invigorating experience. Take some company along if you want. Put on your favorite music and relax, or watch that TV show that you have been wanting to but just didn’t have the time for. There also a number of indoor activities you can do to stay occupied and feel better on a rainy day. Whatever be the activity, ensure you take proper safety measures while trying it out.